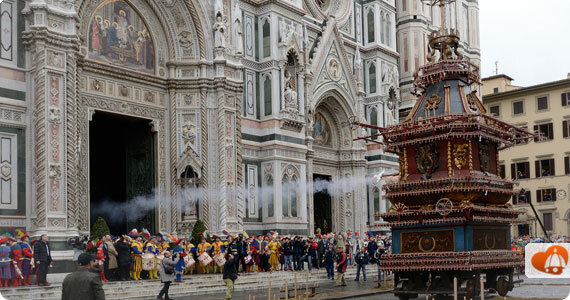 Easter is this weekend, are you ready to see the Scoppio del Carro in Florence? The weekend will be a busy one for Florence and seeing the various posts on our forum and comments asking what is open or closed over the long weekend (as Easter Monday, or Pasquetta as it is called in Italy, is also a national holiday), here’s an update with all of the information you need! Many churches will be busy with extra services, so expect many to be closed or to just limit visiting times from today, Holy Thursday. The monuments in Piazza Duomo, in particular, have special hours, and all will be closed to visitors on Easter Sunday. Easter: Closed to visitors but open for services, of course. The crypt will be closed April 17 and on Easter, April 20th. Open on April 18 and 19 as the cathedral above. The cupola will be closed April 18 and on Easter Sunday but will remain open April 17 from 12:30 to 3:30pm and on April 19th, from 11am to 3:30pm. It normally closes all four days, so this is different than what you might find elsewhere for past years. Giotto’s bell tower and the Opera del Duomo Museum will be closed only on Easter Sunday and open from 8:30am to 6:50pm the other days. The Baptistery exactly the same but closes 20 minutes earlier, at 6:30pm. As far as stores go, expect many to be closed on Easter Sunday and Monday but not downtown, where you’ll find several boutiques, shops and all cafes and restaurants open. The Uffizi Gallery, Accademia Gallery and The Medici Villa of Cerreto Guidi: from 8:15am to 7pm. The Medici Villas of Castello, Petraia, and Poggio a Caiano: from 8:15am to 6:30pm. Palazzo Vecchio: special opening from 9am to midnight. San Marco Museum: from 8:15am to 4:50pm. Bargello National Museum: from 8:15am to 5pm. Boboli Gardens: from 8.15am to 6:30pm. If you’re still looking for more ideas of what to do during Easter in Tuscany, read this article. HAPPY EASTER?